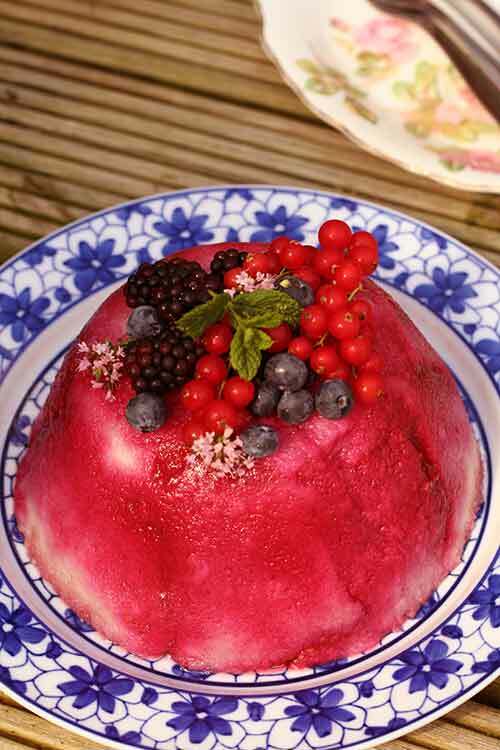 Alchemy in the Kitchen: Boozy Summer Pudding – Bread + Berries + Booze = Brilliant ! 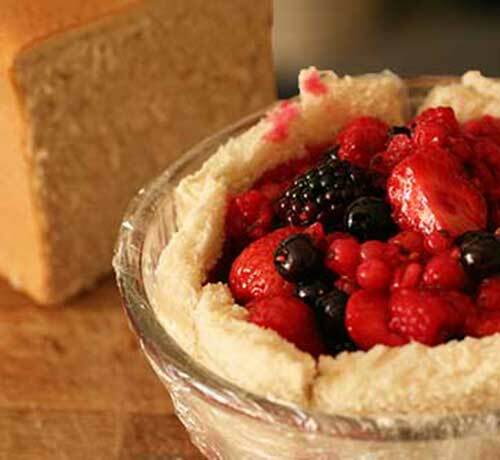 Boozy Summer Pudding – Bread + Berries + Booze = Brilliant ! I’ve mentioned my school cookery class before. The course was probably subtitled “How to Make Kids Loathe Food”. 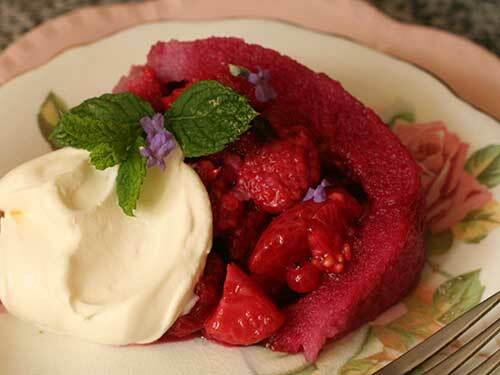 Without doubt, it worked for certain dishes – like Summer Pudding. Honestly, how can stuffing bread with a few berries in sweet syrup ever amount to anything, especially if the bread is industrial and the berries from a tin. A friend served me Summer Pudding recently. I poked at it suspiciously remembering the awful school version. However, when I ventured to taste it, my taste buds died and went to heaven. It was one of the sunniest desserts I’ve eaten in a long time. You need to use a day old bread with integrity – that is, with a good springy crumb - and ripe fresh berries. However, the key ingredient is Time – it’s essential for the bread to soak up all the lovely berry juices so make it the day before you need it. Like any simple dish, it will have a thousand variations. Purists will argue over the type of berries to include. I’ve chosen some of my favourites and included the slightly autumnal blackberries because they were sweet and available, and free. Vary the proportions according to preference and availability. In total you’ll need about 1.125 kg of berries. 1. Choose a few perfect fruits for the top of the pudding and set aside. 2. Hull and halve the strawberries and place them in a non-metallic bowl. Sprinkle with the tablespoon of sugar. 3. Place the rest of the fruit in a medium saucepan with the remaining sugar, Triple Sec and water. Heat gently until the sugar has dissolved and the fruit has begun to release its juices – this will only take 3 – 5 minutes. You want the fruit to hold its shape as much as possible. As soon as the sugar has dissolved, remove from the heat and add the strawberries to the pan. Stir gently to distribute them throughout the rest of the fruit. Taste and add more sugar if required. 4. Line a 1 litre pudding bowl with cling film, leaving an overhang large enough to cover the base of the pudding when folded back across. (It’s easier to line the bowl with two overlapping strips of cling film rather than trying to shape one sheet to fit the bowl.) Cut a circle from one slice of bread large enough to cover the base of the pudding bowl. Do this as neatly as possible as this will form the top of the finished dessert. Cut and arrange slices of bread to line the sides of the bowl – like a bread patchwork - leaving no gaps. If you have any tendency towards engineering or architecture, this is your moment to shine. 5. Spoon the warm berries and boozy juice into the lined pudding bowl and finish with a layer of bread to seal in the berries. Berries n booze n bread should equal bleaughhh... but Alchemy intervenes! 6. Fold the cling film skirt over the pudding and cover with a small plate or saucer that just fits inside the pudding bowl. Weigh it down – I sit a couple of 400g tins on top of the plate. When it has cooled, transfer it to the fridge and leave it – still weighted – overnight. 7. To serve, fold back the cling film. Cover the bowl with a large inverted serving plate. Carefully flip the pudding upside down and remove the cling film. Decorate the pudding with the reserved fruit. Cut into wedges and serve with whipped cream. Note: if you prefer to leave the booze out, substitute it for the same amount of good quality berry cordial (undiluted). Me encantan las bayas son mi adicción te ha quedado maravilloso el postre,abrazos hugs,hugs. That looks wonderful! And so simple! Can't wait to give it a go. This is certainly taking the blaah and kicking it up a notch..
Am smiling in icycold winter Australia!! - What on earth spells more British summer real and happiness - creating? [Except for the ruddy Olympic medals you are taking off us!!!!] Grew up with this, but in addition to giving it maturation time, it's all up to fresh and happy ingredients! @ Parsley Sage - I can imagine a gorgeous Cayman version of summer pudding - the key is plenty of juice. Definitely a brilliant summer combination! You had me at boozy! It looks wonderful & that color is gorgeous! This looks sinful! Looking forward to putting my skills to the test on this one... so perfect for a hot summer day! Wow, loved the colour! 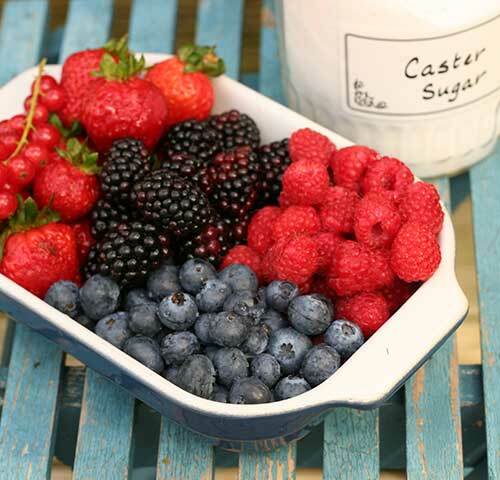 I wonder, how many different kinds of dishes (desserts) are possible with summer berries! This sounds wonderful!! I've only had summer pudding once and I've never made it myself. Now I can't wait for summer to give it a try. Leave the booze out? Never! I've never had this dessert before, but I always love how it looks in pictures. Hester, you have restored my faith in summer pudding with your version. I had one too many of these other versions as a kid and nothing worse than tasting the stale bread, eek! Loving the brill booze version. I've never made one of these but I think you've just inspired me to try! Your boozy summer pudding sounds terrific. A nice way to end a meal. What a lovely summer dessert! It looks so pretty and very tasty!